Firstly, it’s worth noting that HayPigs! HQ is based in the UK. So, we are obsessed about the weather! Too cold, too hot, too wet, too windy – you name it, we talk about it! But as we do experience a varied climate in the UK, then it is certainly something to consider when thinking about housing your guinea pigs ‘outside’. In Winter, your piggies shouldn’t just be left outside to deal with the cold weather, in particular, wind and damp. Their hutches or enclosures need to be protected and ideally brought into an out-house or a shed. For example, our lucky HayPigs! piggies have their own dedicated shed, which is insulated and has a heat lamp for those cold Winter nights. (So yes, then we had to buy a second shed for all of our garden bits and bobs!) An additional bonus to having their own dedicated space is that we can keep everything together that is piggie-related. We have also given them a floor enclosure too, so that they can have a ‘floor-time’ run around in a different set up, keeping their brains and bodies fit through the Winter. Now, not everyone will have the means or the space to have an outbuilding just for their animals, but even if you can find an area within a shed, garage or under a sheltered space to keep them out of the elements, it will help to keep your guinea pigs happy and healthy! Keeping guinea pigs out of draughts is important, so a good tip would be to ensure the shed or outbuilding doesn’t have too many holes that the wind could whistle through! While some ventilation is important, the idea is that they do have extra shelter, so if you need to, see if you can fill any big gaps with something. A shed, for example, doesn’t tend to be ‘insulated’ but this is a DIY project that even novices can attempt! 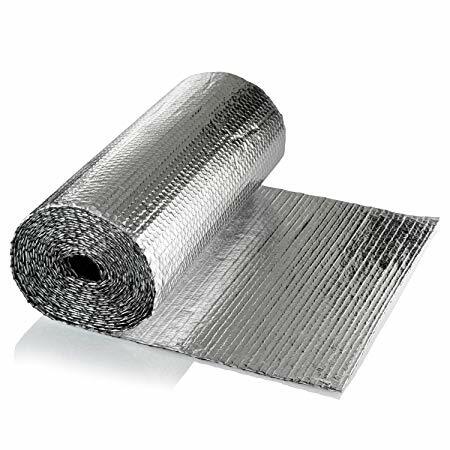 Insulating is easy enough to do; with some rolls of what looks like silver coated bubble wrap and a staple gun, you’ll be good to go. It may well make your shed look like the inside of the Starship Enterprise, but hey, it’s worth it! Our second tip would be to lift the hutch up off the floor so it’s up and away from draughts and the damp. Another easy win, is to put some old fleece or thick blankets over the top of the hutch for additional warmth. 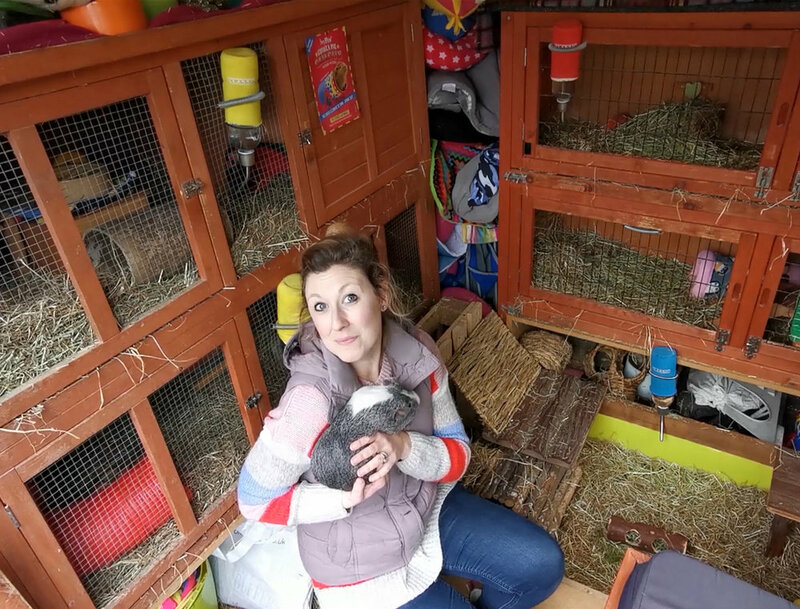 Heat rises and escapes upwards, so in a similar way to insulating the loft in your house, a heavy blanket on top can help keep warmth within a hutch. It can also be useful to have a thermometer. We use a digital max/min thermometer so we can also check how cold it’s getting during the night. If you want to go the extra mile, and we certainly wouldn’t be without ours, then you can invest in an infra-red heat lamp. A good agricultural shop can usually help you out with this and whilst you won’t necessarily need it on all the time, there are always periods of winter when it gets cold and frosty or even snowy. Something else we have also added in more recently is a dehumidifier. This will help remove any excess moisture that might be in the air, again helping against any potential damp issues. Finally, think about your bedding choices within the hutch and make sure your piggies have lots of places to snuggle and keep themselves warm. We bed our guineas on newspaper (find a friendly neighbour who will donate their used newspapers to you!!) with loads of hay on top. Not only is a hay the most important part of a guinea pig’s diet, it also keeps them warm in Winter months. Make sure you use plenty of it, so they can burrow underneath it to get cosy! Piles of hay also encourage guinea pigs’ natural foraging behaviours, keeping their minds active. A fun fact that’s worth noting, is the use of a ‘haybox’ as a cooker! Food items are heated up to boiling point and then the pot containing the food is placed in a box, which is packed out all around with hay. Hay is such a good insulator, that the food then continues to cook within the haybox. So, it just shows you, it really works to keep things warm! For extra cosiness we use some fleece items in their hutches too. A fleece hidey or cosy tunnel (check out our HayPigs! Circus Hidey Hut!) works well as a safe and warm place to curl up. Just be sure to check fleece items don’t get damp with pee, so change them and/or the pee pads regularly to keep things clean and fresh. The Sungglesafe heat pads also fit inside our fleece circus hidey hut, so on frosty nights, your piggies will love to snuggle on their version of a hot water bottle! One thing to just be aware of, is that it’s better to make a decision on where you will house your piggies for Winter, and then stick to it! Don’t keep moving them from inside to outside, as this could be more detrimental to their health with the big changes in temperature. So hopefully, there have been some useful tips here for Winter living for your small furries. To find out more, why not check out our YouTube video on the Winter Shed Tour (see below). Now, roll on Spring…and then Summer, when we can start worrying about how to keep our piggies cool in the hot sunshine!! !